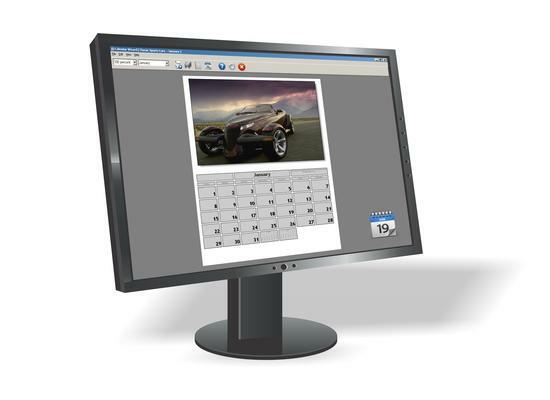 Calendar Wizard will create and print calendars. Unlike commercially available dog calendars that never seem to offer the breed you like, Boris calendars that aren't as adventurous as you remember them being in years past and bank calendars which you know full well are only free because the bank wants your money, Calendar Wizard's calendars can be customized to suit your taste and whatever pictures you'd like to look at for the next twelve months. Create calendars of your family and friends, the greatest carburetors of the 1950's, breathtaking images of mildly repulsive wildlife, your proudest golf swings, unmentionable graphics downloaded from the Internet, your twelve favorite Grateful Dead album covers, close-up photographs of the moons of Jupiter, famous people with last names no one can easily remember at a party, your entire collection of decorative socks... the list is endless. Calendar Wizard's calendars also make excellent gifts if you're really cheap. Easy to use and quick to learn, Calendar Wizard will have you denuding acres of old-growth forest to create professional, attractive calendars in minutes. Its internal pagination function can print double-sided calendars which hang like conventional bank calendars — even if you don't have a double-sided printer. Build complete calendars in minutes. Create dodecahedral calendars — 12-sided three-dimensional desk calendars. Import graphics from many popular Windows applications. Create calendars for any year from 1583 onward — perfect for friends who seem to be living in a time warp most days. Add your own important dates to your calendars. Exchange calendar files with other users of Calendar Wizard. IMPORTANT: Calendar Wizard requires access to the Internet to validate itself after installation. Please see the discussion of registration key security for a detailed discussion of this functionality. Click on one of the following links to download Calendar Wizard 9.0a revision 1. This file is 19,200,512 bytes in length. The downloadable installer for Calendar Wizard includes an example calendar that illustrates some of its coolest features. As of this writing, if you have previously registered or upgraded to Calendar Wizard 8, you can still upgrade to Calendar Wizard 9 for half price. We are able to provide some limited support for the version 8 software, but it's becoming increasingly vulnerable to changes in Windows and some third-party security products. Calendar Wizard 4, 5, 6 and 7 have reached their ends-of-life, and they have been removed from distribution. We no longer have replacement installers for these products. We are able to provide replacement registration keys and limited support for Calendar Wizard 7. We recommend that you register Calendar Wizard 9. Calendar Wizard 2 has reached its end-of-life, and it has been removed from distribution. We no longer have replacement registration keys or installers for this product, and support for it has ended. We recommend that you register Calendar Wizard 9. Calendar Wizard™ is a trademark of Alchemy Mindworks Corporation.